Aloo gobi (potato with cauliflowers, Indian style) is a very simple and humble dish. It’s a dish that most would cook on a pan, and normally doesn’t take too long. 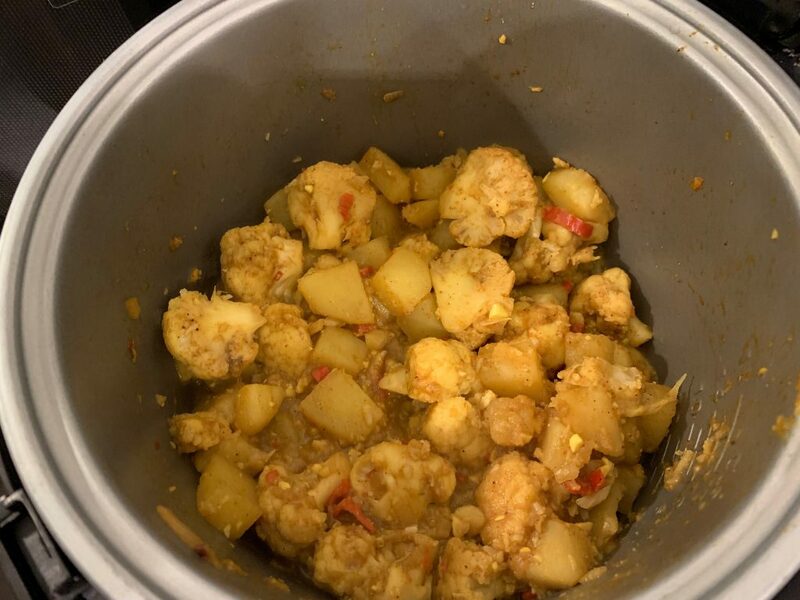 However, we have slow cookers that allow us to multi-task while it’s doing it’s magic, and I thought I’d give aloo gobi a try. In your slow cooker, combine all ingredients except the fresh coriander, and stir it all up. Add 1/2 cup of water (roughly 100 ml). Cook on low for 4 hours, or high for 2 hours. Stir it halfway if it’s possible. Right at the end, leave the cover open for a few minutes while the cooker is on to allow it to dehydrate. Add the coriander leaves just before you’re ready to serve the aloo gobi. It turned out great, just like how I used to have it growing up. 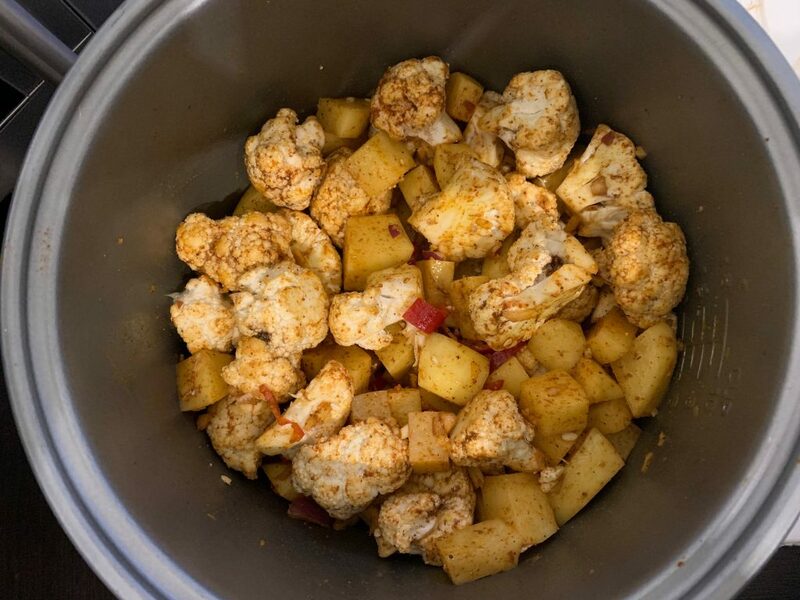 This entry was posted in Recipes and tagged Cauliflower, Home Cooking, Indian, london, Potato, Recipes, Slow Cooker on January 25, 2019 by rs. TL;DR It’s a beautiful restaurant, but the food is average. You can get better value somewhere else, or at another Ivy establishment. 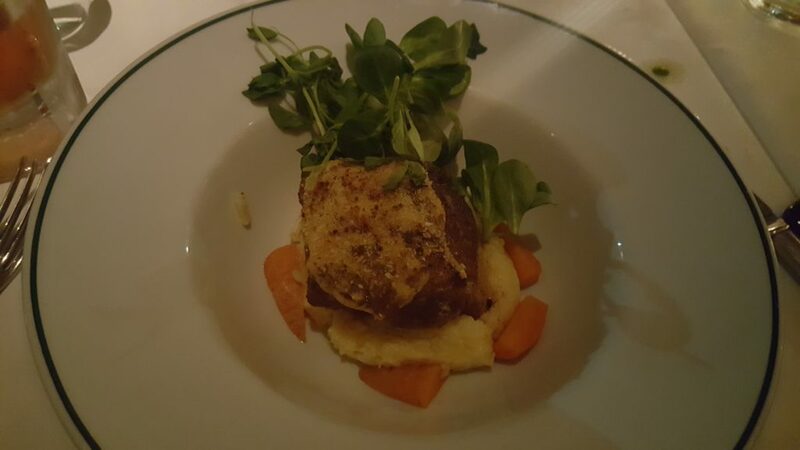 One of my new year’s resolution is to get back into blogging, and have been meaning to post a review on The Ivy in Canary Wharf. I was there on 31st December to celebrate New Years. The Ivy is a fairly new establishment in the Wharf, and is located just opposite Waitrose/John Lewis. From the outside, it doesn’t look like much, but what differentiates itself from other equally priced establishments in the Wharf is the tastefully decorated interior. Just head over to their gallery to see what I mean. 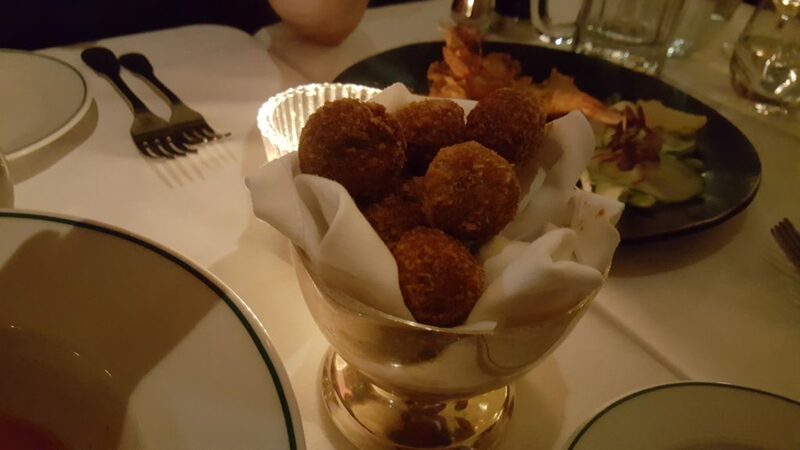 This was not my first time at The Ivy: I dined here a couple of weeks after they opened their doors (October 2018), and was left severely underwhelmed with the food – it was average. I reasoned that they’ve just opened and were probably ironing out some issues. There was some hope that this time around, that they would have fixed their kitchen issues and start delivering some quality food, but sadly, that didn’t really happen. I was in a party of three, and we went with two courses off their a la carte menu. First up was their truffle arancini, which was great. It was crispy at the right temperature and the truffle really comes through. I am a sucker for truffle, and can’t get enough of it. This was a win in my mind, but everything from this point was average. Next up is their roasted scallops with chorizo and butternut squash. This dish is a mess. 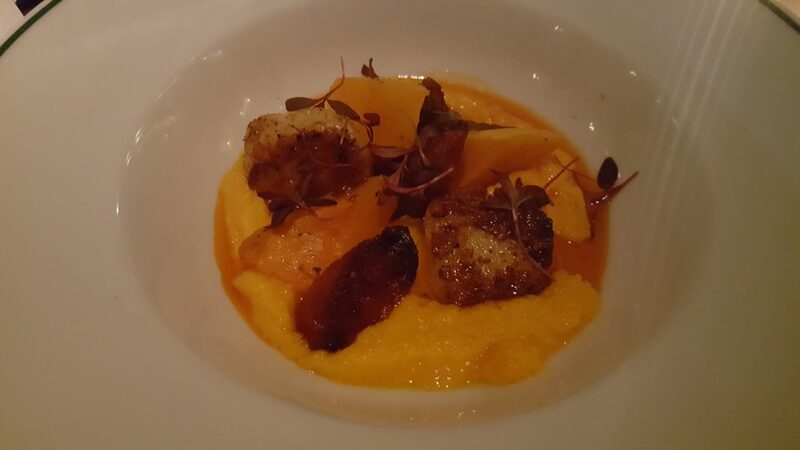 Scallop is delicate and the texture you get from pairing it with chorizo and butternut squash makes it feel like you’re having some baby food. The chorizo was so strongly flavoured that the scallop was entirely lost. We did have their tempura prawns as well, and I didn’t bother taking a photo of that as it was just the same tempura prawns you get from Wasabi with an edamame sauce. After an underwhelming set of appetizers, we were looking forward to the main course. Their lobster linquine was “OK” I guess. There’s really nothing much to say about it, except that it felt like it came out from a chain restaurant (like a Pizza Express or Zizzi). I would have expected the sauce to have some flavour off the lobster, but there just wasn’t any. While various components were prepared well, they were probably not made together. Their lamb shoulder was good. The meat was cooked well, and matched well with mash, carrots and gravy. It’s a perfect winter meal, and that’s just about what I can say about it. It’s on par with some of the better gastro pubs out there, and that does say something about this restaurant. 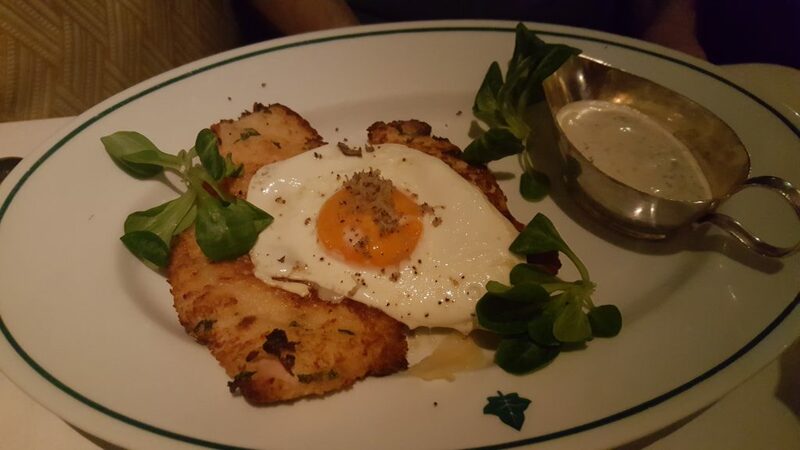 The final main course was their chicken milanese which was topped with a sunny side up and served with a parmesan and truffle sauce. This was probably the best main course of the three (see, I’m a sucker for truffle). The chicken was cooked perfectly to a crisp and went really well with the sauce. If I had to return, I would get this without thinking twice. We did get two portion of their truflle chips and a creamed spinach. We returned one portion of fries because it was cold. The spinach was not creamed. There aren’t any photos of the side as my potato camera phone took really bad ones. Overall, it was a bang average experience in a beautiful setting. There were other issues that I didn’t mention. Somehow, magically, a £95 bottle of Laurent Perrier Rose showed up in our receipt. The service was a little slow and could be improved because they were not that busy for New Year’s eve. Now, let’s talk about value for a second and I’m not being a tight git: without drinks, the two course meal with a side came up to £37 per person, and when you add a 12.5% service charge, that brings it up to the £40ish range. Here’s my issue with this particular Ivy restaurant: for that price, you’re better off going somewhere else, or even a different Ivy restaurant (the one in Marylebone is fantastic!) as the food just doesn’t come up to par with the restaurant itself. In that price bracket, there is some serious competition, and to stand out, a restaurant needs to deliver an overwhelming experience consistently – something this Ivy has failed to deliver over two occassions. Personally, I suspect that most people will bring their dates to this place to impress them – it is a beautiful property after all. However, if it does want to make it memorable, the food has to deliver. It’s such a shame that after serving meals for a few months, the same consistency issues are still around. 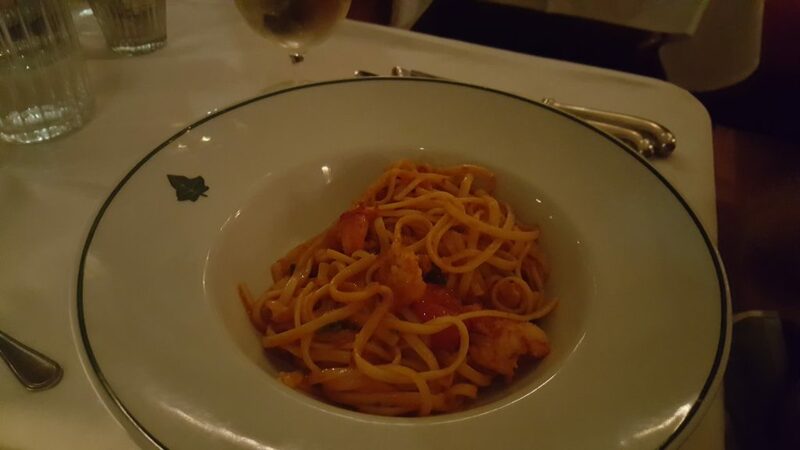 This entry was posted in Restaurants, Reviews and tagged british cuisine, canary wharf, london, restaurants, review, the ivy on January 20, 2019 by rs.